REAP Application Form 2017: The RTU has all prepared itself to start the online application process for REAP 2017 and hence the candidates waiting for it can start applying for the REAP 2017 in May 2017. The application form will be provided by the Rajasthan Technical University, Kota. All students need to apply for Rajasthan Engineering Admission Process by submitting the REAP Application Form 2017 on or before the last date by following the RTU official website, i.e. rtu.ac.in/RTU/reap/ There will be no exam for taking new admission in B.Tech courses. Admission of the aspirants will be on the basis of JEE Main Exam 2017. Candidates will be got the admission in the various Governments and self financed institutes of engineering in Rajasthan State only. Rajasthan Engineering Admission Process 2017 is for providing the seats to applicants in engineering courses according to the performance of that in JEE exam. Visit the official website of RTU, i.e. rtu.ac.in/RTU/reap/. Make an online registration and login to official site by entering the created user Id and Password. See application form link and open it. Read all instructions carefully of applying. Fill the application form by correct info of applicant. Upload required academic documents, recent photograph and sign scan copy in the application form. Upload JEE Main Exam score card in the application. Recheck application form and submit the form. Take a printout copy of application form for further need. The application will be Rs. 850/- for apply the application form. You can pay the application fee in the Online Mode/ Offline Mode. The online application Form of REAP 2017 will be provided online on the official site of RTU. Aspirants need to apply the application form before the last date of application. 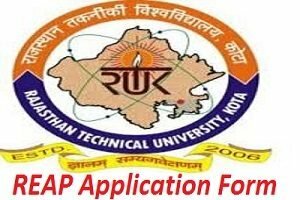 The RTU will be releasing the Rajasthan Engineering Admission Application Form 2017 in May Month for applying. Every year a large no of students apply the application form for new admission. Students need to see the eligibility criteria before applying the application form of otherwise the Application Form of Rajasthan Engineering Admission Process 2017 will be discarded by exam community. For any type of assistance, while applying for the REAP Admission Form 2017, you can contact us by commenting at the end of the post.